The Vikings' Guy Littlefield scores 28 points, including a game-tying three with 15 seconds remaining. The Forest Grove boys survived a harrowing first half, a raucous crowd, and an "enthusiastic" officiating crew to defeat rival McMinnville 65-55 in overtime, Saturday night, Jan. 19, at Linfield College in McMinnville. In a game marred by a lot of talk, juvenile behavior, and a combined 62 fouls, the Vikings boys played above the noise and made plays when they mattered most — at the end. "We came out and worked our butts off on defense and played a great defensive game," said Forest Grove's Henry Tonges. "We came out, stayed together and executed. That win just feels amazing." Forest Grove's Guy Littlefield — who finished with 32 points — made a three-pointer with 15 seconds remaining in regulation to push the game to overtime, then helped salt the contest away with a series of free throws following what could only be described as an embarrassing series of events midway through the extra period. With the Vikings leading 56-50 with 1:24 on the clock, McMinnville's Parker Spence fouled out and received a technical foul for arguing with the referee. Then, shortly thereafter, the Grizzlies' Luke Arzner received his second technical of the game as a result of arguing from the bench, setting up a series of Forest Grove free throws which ultimately iced the game. The Grizzlies pressured from start to finish and in the process dis a lot of grabbing, a lot of talking, and at least on this night, a lot of fouling as a result. It's a tactic that can often throw teams off their game, but the Vikings kept their composure and for the most part played the buffoonery against the home Grizz. "I think our team handled it better, because they obviously didn't handle it well," said Littlefield. "I'm proud of our guys for playing through a tough situation because on the road that's often some of the stuff you're going to get." Forest Grove head coach Greg Evers echoed Littlefield's sentiments, speaking to the effort they put in as a means of handling situations similar to what they saw from Mac. "The guys handled the nonsense fantastically," the coach said. "We work on that and do so many things that help build us and the ability to cope in situations like that." The Vikings didn't however cope with McMinnville's pressure well in the first half, committing a bevy of turnovers and mustering just 14 shots in the first 16 minutes. Thankfully though, at least from a Forest Grove perspective, the Grizzlies too struggled, managing just an 18-14 lead at the half. 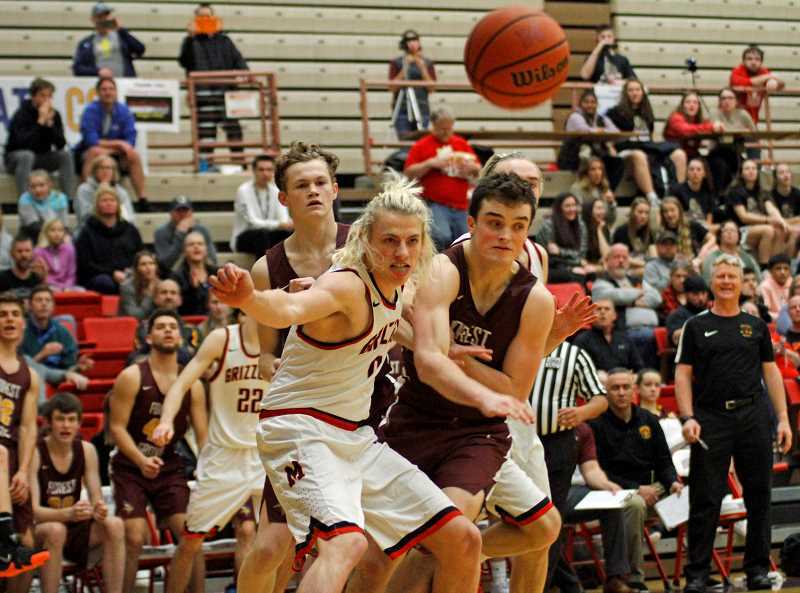 But in the second half the Viks attacked the press rather than cope with it, and due to such created scoring opportunities in transition, as well as in the half-court game as a result of a muddled McMinnville defense. "We struggled early on, but we came in at halftime and said we have the tools to beat this team," Littlefield said. "We executed and handled their pressure a lot better in that second half." Evers said the adjustments allowed his team to play to its strength, by putting the ball in Littlefield's hands and not in the hands of a player who's unaccustomed to handling the ball against high-level pressure the likes of the Grizzlies. "We made an adjustment to get Guy into the middle," said Evers. "Initially we had him back and we were throwing it to someone who wasn't used to attacking, so we went from a half court attack to a more full court attack, and that put Guy in the middle and that was the biggest difference." The two teams battled throughout the third quarter, McMinnville getting their points from Arzner and sharp-shooting Tyler Logsdon, and the Vikings from a handful of players, including Littlefield, Tonges, and Adison Emerick who helped tie the game 33-33 with just a quarter to play. There were three lead changes over the first couple minutes of the fourth quarter and Mac took a two point lead when Logsdon and Spence made four straight free throws with just over five minutes remaining. But that's when things started to unwind for the Grizzlies, beginning with Arzner's first technical which allowed Littlefield to tie the game at the free throw line. Four more McMinnville free throws and a Spence runner put the home team ahead 46-41, but the Vikings closed the gap to 48-45 with under a minute to play, setting up the dramatic end-of-game scenario. Littlefield dribbled the ball up the floor and quickly found Emerick alone in the corner. The senior wing then dribbled towards the key, and when the Grizzlies defense closed on him, he passed back to a wide open Littlefield at the top of the key and the junior guard calmly set and released, ending with the ball at the bottom of the net and tying the game 48-48. "We were thinking quick two, then foul," said Littlefield. "Then I broke my guy down, made the pass, he drove and they collapsed, he passed it to me and I was able to knock it down. I have the confidence in myself to knock that down." Evers was confident in the shot as well, speaking more to Littlefield's flair for the dramatic. "That wasn't a great three-point shooter making a shot, that's just a guy making a great play," he said. But with 15 seconds left, Arzner drove the length of the court and missed in the lane. Littlefield got the rebound and quickly threw to an open Braden Hudgins whose buzzer beating lay-in rimmed-out, sending the game to overtime where the Vikings weren't to be denied. With the win the Vikings improved to 13-4 overall and 3-1 in the Pacific Conference, tied for second behind undefeated Sherwood. Littlefield spoke afterwards about what a win like this can mean to the team as they move forward through the league slate, along with — hopefully — towards the postseason. "McMinnville is a good team and a playoff level team," he said. "This win will help us down the road." And what did Tonges think of the big win? "People had Mac, Sherwood and Newberg in the top-3 in our league before the year, and for us to get this win was a statement to be in that top-3. And we think we can do it." 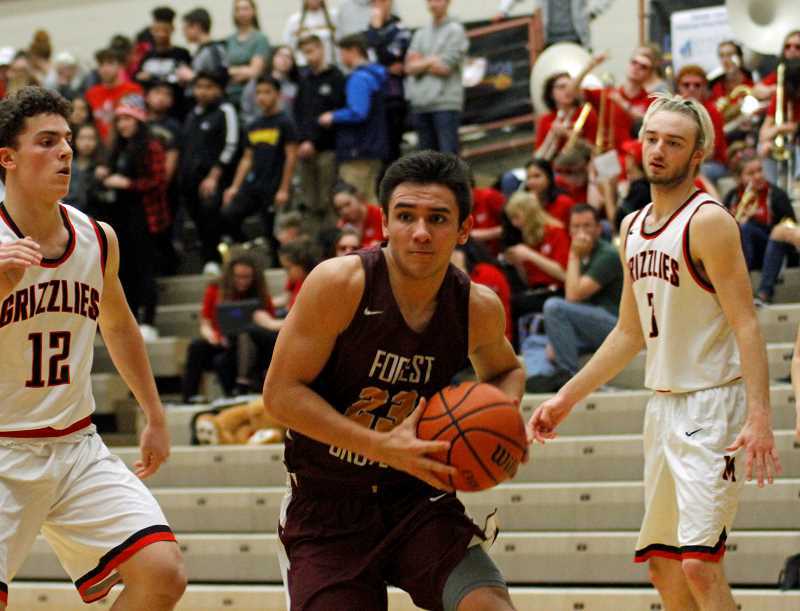 In addition to Littlefield, Forest Grove was led by Tonges and Emerick who scored 11 points a piece, and Ayden Purcell who tallied 10 rebounds for the Viks. McMinnville was led by Logsdon who scored 11, and Arzner and Spence who combined for 20 points and 14 rebounds.